Students in Mrs. Thompson's lower division art class (@seeingnewshapes) participated in a wonderful STEAM lesson project this year involving art and magnetism. If you haven't heard of STEAM before, it stands for Science, Technology, Engineering, Art and Math. More information about STEAM as an educational and learning philosophy is available on stemtosteam.org. This 3 minute video includes audio interviews with Mrs. Thompson and some of her students, discussing the Force Painting project. Listen to how much students learned about science concepts including electro-magnetism in this project! Some students also returned to their classroom and wrote in their writing journals with their homeroom teacher about the things they'd learned in art class! What a great interdisciplinary lesson for our young artists! That audio interview video was created on a classroom iPad using the free app, Voice Record Pro. That exported video was combined with other iPad video clips using the free app, YouTube Capture. This is a photo of some student "Force Painting" projects shared during our recent Lower Division Art Show! 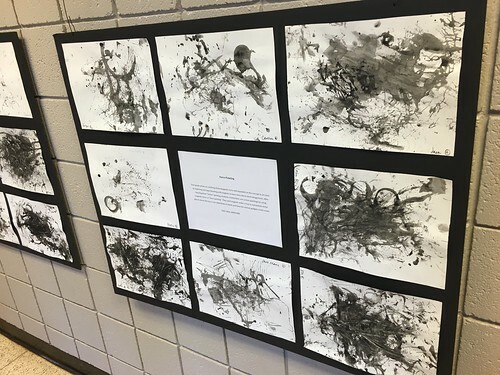 For more about the Art Show, check out this page on Mrs. Thompson's classroom website. Also, if you're on Twitter, be sure to follow Mrs. Thompson's class on @seeingnewshapes. Mrs. Thompson and Dr Fryer (@wfryer), our Casady School Director of Technology, shared some lesson ideas related to STEAM and Creativity at the February 15, 2016 Casady "Conference on Education" and the February 19, 2016 OMLEA Conference in Tulsa, Oklahoma. Check out the Google Slides from those presentations for more information. Innovative things are happening in our Casady School classrooms! Next time you see Mrs. Thompson, ask her to share more about Force Painting and STEAM projects! Welcome to our Learning Showcase, an online space where we amplify the work and voices of our students and teachers at Casady School in Oklahoma City! Please direct questions about this website to our Director of Technology. Read more about this site on our welcome post. Many of the interviews shared here are featured in "Technology Tuesday" emails sent to our faculty and staff. Our "Technology Tuesday emails" are archived in this Google Doc. More information about Oklahoma Learning Showcase websites is available on OklaEd.us. We invite you to copy and remix what we're doing to digitally amplify voices of innovation and engaged learning at YOUR school! If you do, please let us know.